I really enjoy Peter Enns's books and I have learned a lot from them. I actually just finished re-reading another one of his books as research for my Genesis paper for seminary. This book, however, is not so much for the scholars among us as it is for the everyday Christian who is experiencing some sort of doubts in their faith walk. It is a fairly quick read and very accessible. Though some may find the title of the book provocative, Enns is trying hard to set us free from the perceived need for certainty. He is also clear about what he is not saying: he is not saying that what we believe does not matter, but he is saying that many of us have tried to make our faith more about being certain of having the "right beliefs" than about trusting God with our lives. Enns begins with a bit of church history, explaining how we came to rely so much on certainty and "right belief". In the middle of the book he spends some time anchoring us in Psalms, Ecclesiastes, and Job - showing us a biblical precedent for our doubts and struggles with faith. Towards the end of the book, Enns shares with us some of his personal struggles with doubt and his struggle to trust God through some uncertain times in his life, from dealing with a teenage daughter dealing with anxiety and an eating disorder, to losing his job as a professor because of theological differences with the school. I think I may have found this particular book even more helpful to me personally a few years ago, more towards the beginning of my own journey with doubts in the midst of faith. And I think I benefited more from Greg Boyd's book, Benefit of the Doubt, which I read a couple of years ago. But I still would recommend The Sin of Certainty to anyone who has struggled with doubts in their faith. 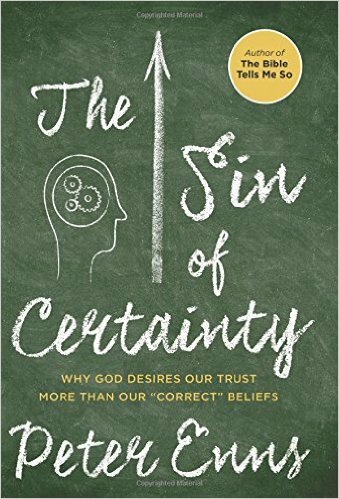 Whether you are having baby doubts or a full on faith crisis, Enns reminds us that certainty is not the point, trusting God is.